Nearly 700 backflow prevention device testers who have been certified by the Cross Connection and Water Pollution Control Program administer the annual testing of over 51,000 backflow prevention devices. This program reviews all test and monitoring results while maintaining an extensive database of all devices. The approved hardware utilized in the protection of the potable water supply through backflow prevention is based upon specifications developed jointly with regulatory agencies, plumbing officials and the manufacturing industry. 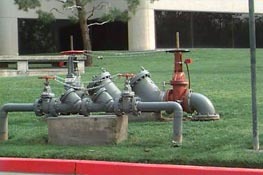 The laboratory and field approval process of the Foundation for Cross Connection Control and Hydraulic Research at the University of Southern California and the Mechanical Testing Laboratory of the City of Los Angeles, Department of Building and Safety are essential in developing a reliable listing of approved backflow prevention devices. Since all mechanical devices are subject to failure, the on-going program for the certification and re-certification of the device testers, as well as the database of backflow prevention device test results are critical in maintaining the integrity of these devices. A listing of currently approved backflow prevention devices, both testable and non-testable is maintained to provide the public with the most reliable hardware available.